8:1.1 In the eternity of the past, upon the personalization of the Infinite Spirit the divine personality cycle becomes perfect and complete. The God of Action is existent, and the vast stage of space is set for the stupendous drama of creation—the universal adventure—the divine panorama of the eternal ages. 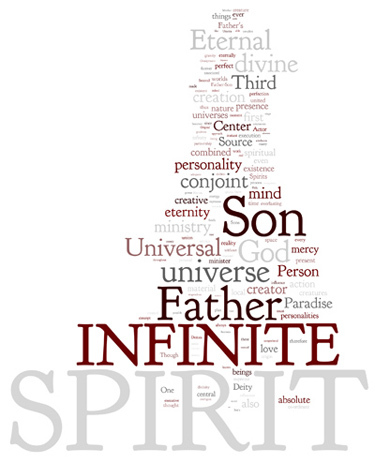 8:1.9 In brief, the Infinite Spirit testifies that, since he is eternal, so also is the central universe eternal. And this is the traditional starting point of the history of the universe of universes. Absolutely nothing is known, and no records are in existence, regarding any event or transaction prior to this stupendous eruption of creative energy and administrative wisdom that crystallized the vast universe which exists, and so exquisitely functions, at the center of all things. Beyond this event lie the unsearchable transactions of eternity and the depths of infinity—absolute mystery. 8:2.6 Though in every way sharing the perfection, the righteousness, and the love of the Universal Father, the Infinite Spirit inclines towards the mercy attributes of the Eternal Son, thus becoming the mercy minister of the Paradise Deities to the grand universe. Ever and always—universally and eternally—the Spirit is a mercy minister, for, as the divine Sons reveal the love of God, so the divine Spirit depicts the mercy of God. 8:4.2 God is love, the Son is mercy, the Spirit is ministry—the ministry of divine love and endless mercy to all intelligent creation. The Spirit is the personification of the Father’s love and the Son’s mercy; in him are they eternally united for universal service. The Spirit is love applied to the creature creation, the combined love of the Father and the Son.